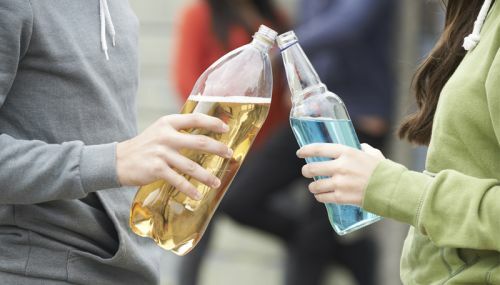 Just under half of young people in the UK had tried alcohol by the time they were 14, with more than one in ten confessing to binge drinking, new findings from the Millennium Cohort Study have revealed. Researchers at the Centre for Longitudinal Studies, part of the UCL Institute of Education, examined data collected from more than 11,000 14 year olds about their experiences of a range of different risky activities, including drinking, smoking and drug-taking. Study participants, whose lives have been tracked through the Millennium Cohort Study since they were born at the turn of the century, had previously been asked about drinking and smoking when they were 11. Comparing their answers at age 11 and at age 14, revealed big increases in the rates of both binge drinking (having five or more drinks at a time on at least one occasion) and smoking among the group. Less than 1 per cent had been binge drinking by age 11, compared to almost 11 per cent at age 14. 3 per cent had tried a cigarette by the time they were 11 with the figure jumping to 17 per cent by age 14. And around 6 per cent of 14-year-olds had taken drugs, mostly in the form of cannabis. Looking at the teenagers’ backgrounds and where they lived, the researchers identified some interesting patterns. Comparing similar boys and girls, substance related activities were a little more common among the boys than the girls by age 14, and boys were also more likely to have started these activities at a younger age than girls; 20 per cent of boys had drunk alcohol by the time they were 11, compared to 14 per cent of girls. Substance use was much less common in Northern Ireland than in other parts of the UK, with comparatively low rates of drinking, smoking and drug-taking. On the whole, ethnic minority teens were less likely to use substances than their white peers. 94 per cent of Bangladeshi 14-year-olds said they had never tried smoking, drinking or drugs, compared to just 44 per cent of white British 14-year-olds. 14-year-olds who had reached or been through puberty, and also those who identified as being gay or bisexual, were more likely to drink, smoke and/or take drugs. Teens were also at greater risk of taking up these activities if they were from a single parent family or had parents who drank frequently or took drugs. Interestingly, in the main, parents’ education neither increased nor decreased the odds of their teenage children smoking and/or drinking. These findings are based on the briefing paper, ‘Risky Behaviours In Adolescence. Initial findings from the Millennium Cohort Study Age 14 Survey‘. For a further analysis of these findings, see the working paper, ‘Determinants Of Risky Behaviour In Adolescence Evidence From The UK’ by Emla Fitzsimons, Jenny Jackman, Arabella Kyprianides and Aase Villadsen.